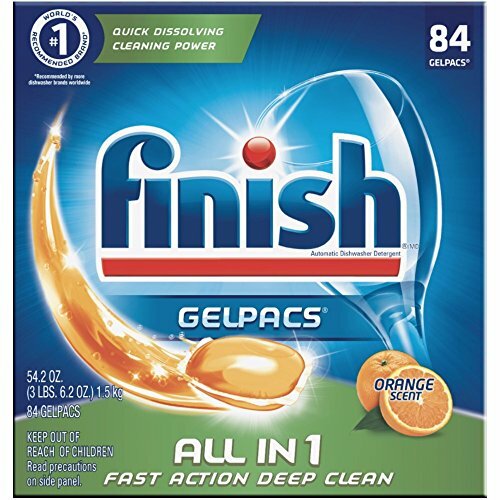 From the World's #1 Recommended Brand*, Finish All In 1 Gelpacs tackle tough messes. It has 3X concentrated cleaning power of regular Finish Gel. Our revolutionary Pre-Soakers burst into action to scrub away tough food residues like baked-on lasagna and dried-on oatmeal. Our Powerful Cleaners remove even the toughest stains and gently scrub your dishes & glasses sparkling clean. All In 1 Gelpacs are easy-to-use & pre-measured pods with a refreshing orange scent that are safe for septic systems. *More Dishwasher Brands Recommend Finish products Worldwide than any other brand. Recommendations as part of Co-marketing Agreements.